Catamaran yacht based in Nassau, Bahamas. Serving couples, families, and corporate outings. Islands of the Exumas or Eleuthera Islands on a multi-day charter. Experience through Bahamas Catamaran Charters yacht management. Captain Craig Doring is the owner, captain, and chef for Bahamas Catamaran Charters. We specialize in multi-day and single day charters. There are a variety of LAGOON catamaran models available for clients based on their preferences for luxury and party size. Up to 10 guests can choose to join them on a breathtaking vacation summer route to the Bahamas or during the winter season to the Virgin Islands. As your Bahamas catamaran vacation experience, clients are shown the best and most unique spots en route to each destination to enjoy freshly caught yellow fin tuna or bull dolphin and the most sought after diving spots in the Caribbean. An avid sailor since the age of 14, Captain Craig Doring has over 25 years of experience in sailing. A graduate of the University of Washington, Captain Craig sailed for several years racing sloops in the Puget Sound and joining his uncle on cruises in the San Juan Islands. After spending many years fishing the Bering and Nor seas, Captain Craig returned to his passion of sailing personal yachts with Moorings and delivering private yachts throughout the Caribbean. 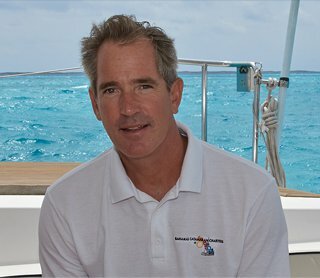 As proprietor of Excalibur Adventures, a small charter company founded in 2000, Captain Craig catered to serving youth in their sailing adventures. Captain Craig creates the ultimate Caribbean experience as a USCG captain, a master diver and scuba instructor. By choosing Bahamas Catamaran Charters for your Caribbean vacation, guests will find comfort and adventure in a custom made sailing experience.